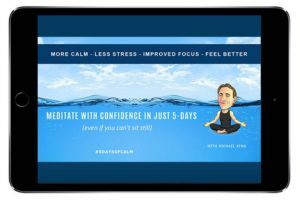 When the Meditate With Confidence workshop launches we’ll make sure to send you an “exclusive” first access pass via email when the time comes! In the meantime if you wanna become better friends I sent some ways we can connect to your inbox and a link below to the #5daysofcalm group on Facebook. An online community for people who meditate, or want to meditate to get the latest tools, tips and practices to enjoy less stress, more calm, and improved quality of life!